Is Fresh Salmon Always Better Than Frozen? Nothing can beat a piece of pristine, truly fresh fish. Yet what's sold as fresh salmon isn't always better than frozen salmon. In fact, it isn't necessarily always fresh. 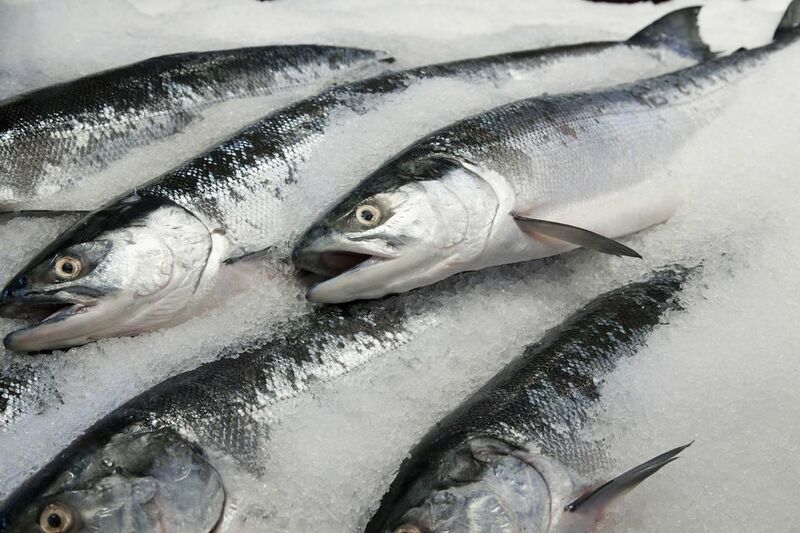 Instead, it's often fresh-frozen, meaning it was frozen after being caught, shipped to your fishmonger or grocery store, and defrosted for sale. Salmon fishermen are on the front lines of this debate, so it's wise to take their advice. Most will tell you that they'd rather eat a piece of frozen salmon that was wild-caught with a gill net, bled immediately (which slows down decomposition), and frozen that day. This process actually "locks" in the freshness. It's preferred over a "fresh" piece of salmon from fish that was farmed or poorly caught, not bled, or fish that sat on ice for days before being properly frozen. These practices offer too many opportunities for the fish to go bad or for bacteria and other unhealthy organisms to grow. For these reasons, it's very important to know where your salmon comes from. The best fresh salmon is actually fresh, never frozen, and wild-caught. Look for fish with firm, brightly colored flesh. Whole fish are the best because you can look into their eyes—no joke. Clear, plump eyes are a supreme sign of freshness in a fish. Those with cloudy or sunken eyes are best avoided. Fresh fish should also smell fresh; like the sea and not really fishy at all. If you can give the fish a poke, the flesh should bounce back when you do so. Don't buy fish that feels soft, mushy, or doesn't spring back into shape. Like cloudy eyes, it's a sign that the fish isn't fresh. For the best flavor and sustainability, many people look for wild-caught salmon. While great strides have been made in making farmed salmon more sustainable, it still uses more small fish to create each pound of salmon. Some farms also use antibiotics and have questionable containment practices. This increases the risk of letting farmed species mix with wild ones. Once it's frozen, the classic signs of fresh fish won't do you much good. Yet it is often easier to get clear information about frozen fish since it frequently has an actual label. Look for wild-caught fish from a sustainable fishery—fisheries up and down the Pacific coast of North America are well-managed. In short, ask your fishmonger where and how the salmon was caught. Better yet, buy salmon directly from a fisherman or a co-op if you can. This allows you to know exactly when and how it was caught. Many salmon fishermen in Alaska and Washington are set up to sell their wild-caught Pacific salmon directly to consumers. Once you have delicious fresh or frozen salmon on hand, try throwing in on the grill. It's definitely one of the best ways to cook this fish. However, there are a number of other ways to cook salmon, too.